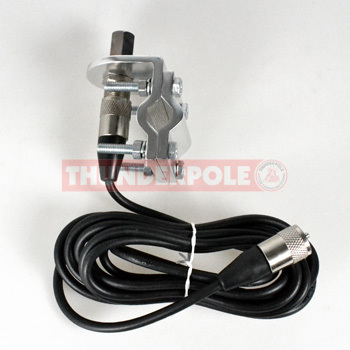 High quality, heavy duty mount for large CB antennna. Fits onto mirror arms, roof racks, etc. Comes with 3/8" stud and 4 metres of RG58 cable and PL259 plug. Will fit on arm from 8mm up to 30mm diameter.